or to the excess deposition of tissue as part of a pathological process. There are different types of fibrosis that can occur in the body, depending on the affected organ: pulmonary fibrosis, cardiac fibrosis, liver cirrhosis. Pulmonary fibrosis is not cystic fibrosis, even if this involves scarring as well. Cardiac fibrosis is usually a result of myocardial infarction and can affect the muscles in the heart but also the valves. Liver cirrhosis presents areas of scar tissue and nodules that replace the normal liver tissue and alter liver function being caused by alcoholism, hepatitis viruses and fatty liver disease. Pulmonary fibrosis – refers to multiple lung conditions that cause interstitial lung damage and scarring. It can also occur as a secondary condition in various other diseases. If the underlying cause is not known the term idiopathic pulmonary fibrosis is used. 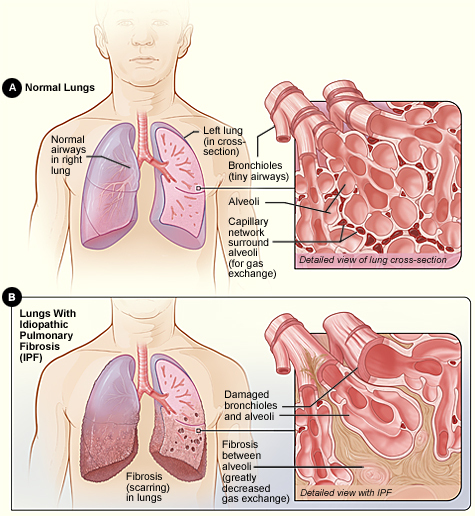 Replacement fibrosis – occurs as a result of disrupt repairing process in lung damage caused by infarction or a pneumonia or tuberculosis infection. Focal fibrosis – occurs as a response to inhaled substances that cause irritation in lymph tissue where the fibrosis begins, substances such as asbestos and silica (silicosis). In most cases the underlying factors that cause pulmonary fibrosis develop over many years and the most affected age range is between 50 to 70 years. Avoiding the risk factors will help to prevent pulmonary fibrosis. Pulmonary fibrosis can be managed with these preventative methods, medication and with good respiratory hygiene and healthy lifestyle. Salt aerosol is indicated to clean the respiratory system and reduce inflammation. Living by the ocean and/or using home salt therapy for at least 7-8 hours daily will make a real difference in the quality of life. Long term exposure to salt particles will strengthen respiratory immunity and improve breathing, so that more oxygen will get into the blood stream.